New Orleans: 1961 The Living Legends - Four Classic Albums - Форум "Клуба коллекционеров"
By the 1950s the traditional jazz revival was well under way. 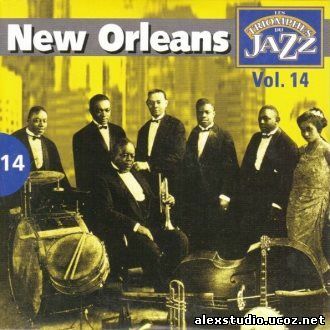 While New Orleans was generally credited with being the birthplace of jazz and those who had "emigrated" from there, such as King Oliver, Louis Armstrong, the Original Dixieland Jazz Band, etc., had been given due recognition, those who had not left the city had gone largely unknown until after the publication of Jazzmen (1939) and the efforts by Heywood Hale Broun, Bill Russell, and others to locate and record them began in the early 1940s. After the Second World War ended, recordings of New Orleans jazzmen such as Bunk Johnson and George Lewis, who gained recognition playing dates in New York, began to be issued on major labels such as RCA Victor, Decca, and Columbia. 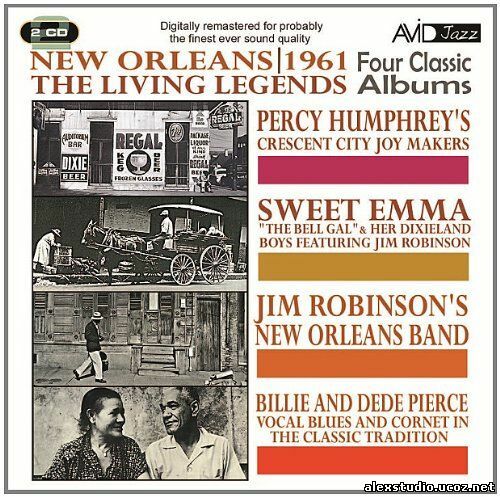 By the next decade, other labels began to see the mercantile opportunities in recordings of native New Orleanians, among them Riverside which, in 1960-1961, set out to record some of these artists still living in New Orleans but largely unknown outside of it for its "Living Legends" series, including those featured on this CD. Several LPs resulted from this endeavour, all recorded at the Hall of the Société des Jeunes Amis in New Orleans. The musicians comprising the bands on this CD were at the peak of their performing abilities at the time these recordings were made. It was at this same time that Preservation Hall was founded in New Orleans, and the majority of the musicians in the bands featured on these discs appeared in one or another combination in the hall. Later, bands under the aegis of Preservation Hall began touring, and I was fortunate enough to see almost all of them as they passed through San Francisco. The four sessions on this disc contain what some consider the definitive recordings of some of these tunes. Jim Robinson, for instance, made Ice Cream his own-it was always requested when he performed, and whoever witnessed him doing it will not forget the dance he did and the white handkerchief he waved at the audience. I recall being in an audience of some 20,000 people at an outdoor concert in Stern Grove, San Francisco, one summer when the Preservation Hall band was on tour, and Big Jim was a little surprised when it seemed the entire audience responded to his handkerchief waving by taking some pages from the Sunday San Francisco Chronicle newspaper, folding them, and waving back. He loved it. This recording was made some half dozen years before Sweet Emma suffered a stroke that paralyzed her left side, and although she continued to perform thereafter, she was not the two-fisted piano player she was in 1961. But she never forsook her trademark red outfit, her beanie, and her bells. In two of the bands, his Crescent City Joy Makers and Sweet Emma's Dixieland Boys, Percy Humphrey played trumpet, which, even when muted, was fiery. He was not averse to reaching for the upper register of his horn on occasion, as opposed to many revivalists who stayed in the middle and low registers. He frequently appeared in bands with brother Willie on clarinet. Percy was invariably focused on his horn, while Willie was more the entertainer, not being averse to getting up to dance a little or strut back and forth in front of the band, much to the audience's delight. Billie and DeDe Pierce also headed up a Preservation Hall band on occasion, although here it is a small group with which they sometimes appeared. Love Songs of the Nilewill forever in most people's minds be associated with Billie Pierce, who almost single-handedly rescued it from the oblivion that it, along with the 1933 forgettable pictureThe Barbarian with Ramon Navarro and Myrna Loy in which it was featured, had disappeared. She and her husband, blind cornetist DeDe, invariably appeared together, whether in a band setting or a smaller group one. Their repertoire contained many obscure blues, some of which are included here. For those not having the Riverside CDs, this reissue on Avid again makes available these classic sides, which belong in every traditional jazz fan's collection. It also does so with superb transfers and at a price that will not require taking out a bank loan. With luck, Avid will also reissue the other Living Legends recordings. Спасибо за подарок… и алаверды к нашему другу JAZZCRAZY!